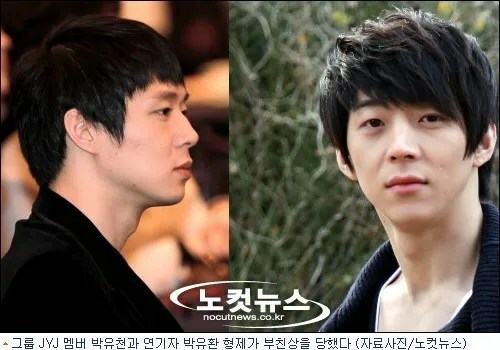 On the morning of March 16th, brothers JYJ‘s Yoochun and Park Yoohwan buried their father to rest after holding a funeral ceremony at the Seoul Sungmo Hospital. Their father had passed away on the 14th. Although Park Yoohwan was able to be by his side during his last moments, Yoochun had been away, and was unable to make it while on his way back. Upon hearing the unfortunate news, Yoochun had rushed to the hospital in tears. Since March 14, JYJ’s Kim Jaejoong and Kim Junsu, Song Ji Hyo, and other individuals from C-JeS Entertainment stayed during the funeral proceedings. Celebrities such as Han Ji Min, Alex, Kara’s Nicole, JUNO, Oh Seung Hyun, Jo Sang Ki, No Min Woo, Hong Seok Chun, Jung Seok Won, Kwak Yong Hwan, Jin Hyuk, Lee Tae Sung, Hong Kyung Min, Song Joong Ki, Yoo Ah In, Jun Tae Soo, Choi Myung Gil, Song Ok Suk, Lee Ki Kwang, Kim Hyun Joong and Kim Seung Woo paid their respects. The funeral was conducted with Buddhist rites and he was laid to rest at the Seoul Memorial Park. May Mr. Park rest in peace and Yoochun & Yoohwan find comfort in good memories. I pray for them. I lost my beloved dad last year and I can understand their feeling. My sincerest condolences to Yoochun, Yoohwan, Mrs. Park and the rest of the family. Only Happiness hearafter, Park Yoochun, only happiness and joy. May God console the grieving hearts of the Park brothers. To Mr. Park, I offer you our Lord’s Prayer, may you rest in peace. R.I.P. Mr. Park. The two incredible sons you and Mrs. Park share with us, will always be in our hearts. We will look after them. i wish for them to find peace in their hearts and solace in each others arms and friends support. we are there in spirit chunnie and hope you will rebound from all this and be ok. we love you guys. time will ease the pain for you and your family and soften any painful memories. just know you are thought about and loved so much. R.I.P. our condolences, love, and support for Yoochun n family. Be strong, YooChun and YooHwan! We will be always there for you. Thank god all went smoothly. May Papa Park rest in peace. I’m so proud of you, my dearest Chunnie. a job very well done~! You’ve done your father proud yet again. You’ve handled the situation unbelievably well, gone are my worries, seriously. as to how you are gonna handle this very heartbreaking news. as to how you are gonna take it. you’ve managed to stay strong and up till the very end of the funeral. Other than proud, it’s still proud. NOW comes the time to take a good and proper rest to recharge yourself. I believe in you, my Prince. and you shall be up and running again. I’m waiting patiently for that day to come. That said…I hope my Chunnie and his Hwannie will get to rest a lil’ more before reporting back to work. I hope he’ll be able to regain his strength by then and report back to work a healthy Prince. but I hope it’ll be soon. and care for you in a difficult time like now. Please promise you’ll take great care of yourself. both need to take a good rest too. I personally think JS is not looking very good either. both are looking like zombies now…poor babies. I’m glad both of them are there for YC, that’s what real brothers are for. Well said, my sis.. Well said!! A real sincere dedication and heartfelt words to our dear Prince Chun. I’m so proud of him too… For carrying out his duties as the eldest son so well and strong. Papa Park and Mama Park have raised awesome sons, ones who would do any parents proud.. I do hope he can find deep rest and peace amidst the emotional turmoil that he’s going thru now before he goes back to the drama set..
And the same to Jaejoong and Junsu, his beloved brothers who were there for him at the lowest times of his life. ‘ hugs Yoochun and Yoohwan ‘ cheer up guys , be strong, this is life and his memory keeps him alive. May he Rest In Peace. Dear Lord, watch over them all and guide them through their time of grief so that they may all come out stronger. be strong, yoochun and yoohwan. we feel you. knowing the pain of losing a loved-one, we, your loving fans not only from korea or across asia, but throughout the world as well, are one with you; amidst this sad and trying moment in your lives. we hope that in time, blessed with God’s grace and consoled by the sweet and loving thoughts from all your fans worldwide, shall help you to carry-on. we love you, so dearly and wish you well.